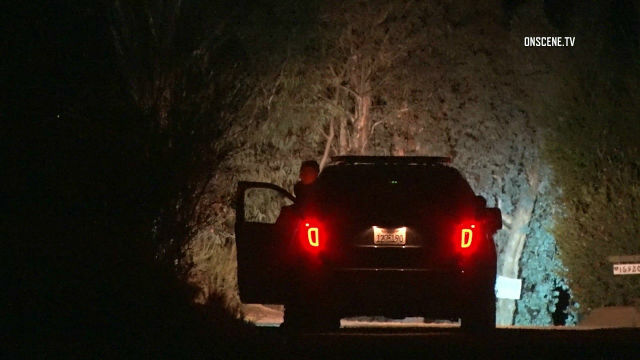 San Diego Sheriff‘s homicide detectives searched Sunday night for the suspect who shot and killed a man outside a rural Ramona home. Gunshots were reported at 8:34 p.m. around Wood Rock Lane and Mussey Grade Road, sheriff’s Lt. Matthew Glisson said. When deputies arrived in the area, they found a man with a traumatic injury on the ground outside the home at 15921 Wood Rock Lane. Paramedics from Cal Fire treated the victim but were unable to save his life, sheriff’s homicide Lt. Michael Blevins said. The victim, whose identity was being withheld, died at the scene outside the single-story home, which sits at the end of a narrow dirt road. A sheriff’s SWAT team helped deputies set up a perimeter “in an attempt to contain any possible suspect,” Blevins said. But a search of the area turned up no suspect. Homicide detectives are now seeking potential witnesses and asked anyone with information about the slaying to call the sheriff’s homicide detail during work hours at (858) 974-2321 or after hours at (858) 565-5200. Tipsters can also remain anonymous by calling San Diego Crime Stoppers at (888) 580-8477.